Downtown • A decade in the works, the stunning playhouse becomes a reality. 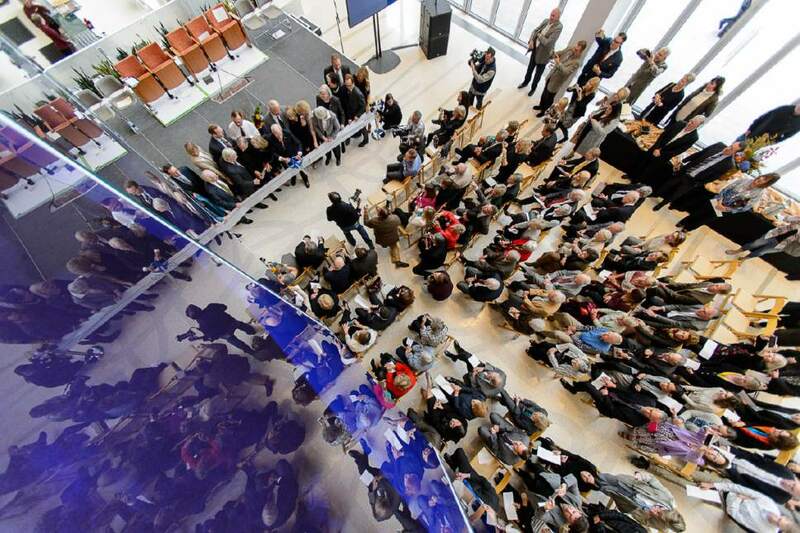 Trent Nelson | The Salt Lake Tribune A ceremony marked the opening of the George S. and Dolores Doré Eccles Theater in Salt Lake City, Tuesday October 18, 2016. 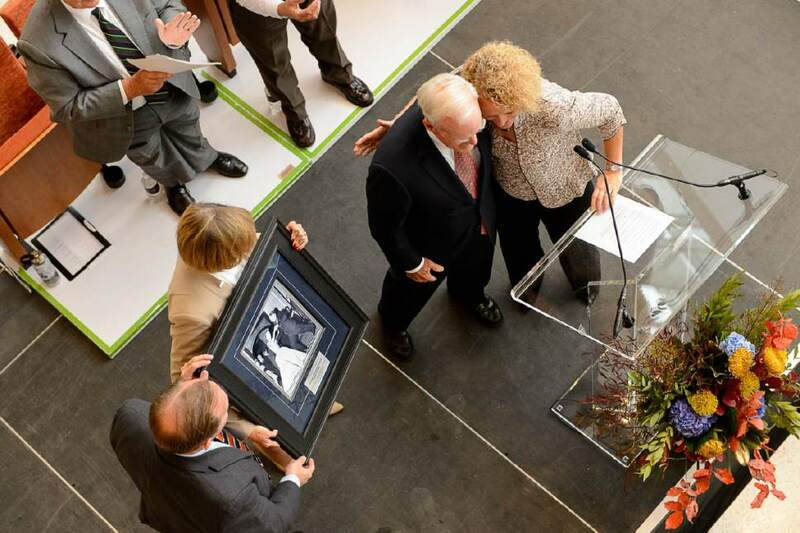 Trent Nelson | The Salt Lake Tribune A ceremony marked the opening of the George S. and Dolores Doré Eccles Theater in Salt Lake City, Tuesday October 18, 2016. Trent Nelson | The Salt Lake Tribune Spencer F. Eccles prepares to cut the ribbon at the official opening ceremony of the George S. and Dolores Doré Eccles Theater in Salt Lake City, Tuesday October 18, 2016. 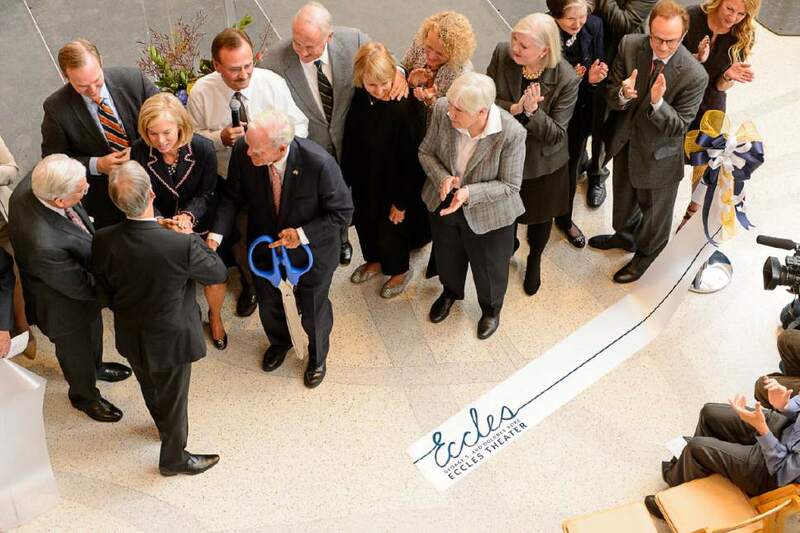 Trent Nelson | The Salt Lake Tribune The ribbon is cut by Spencer F. Eccles at the official opening ceremony of the George S. and Dolores DorÈ Eccles Theater in Salt Lake City on Tuesday. 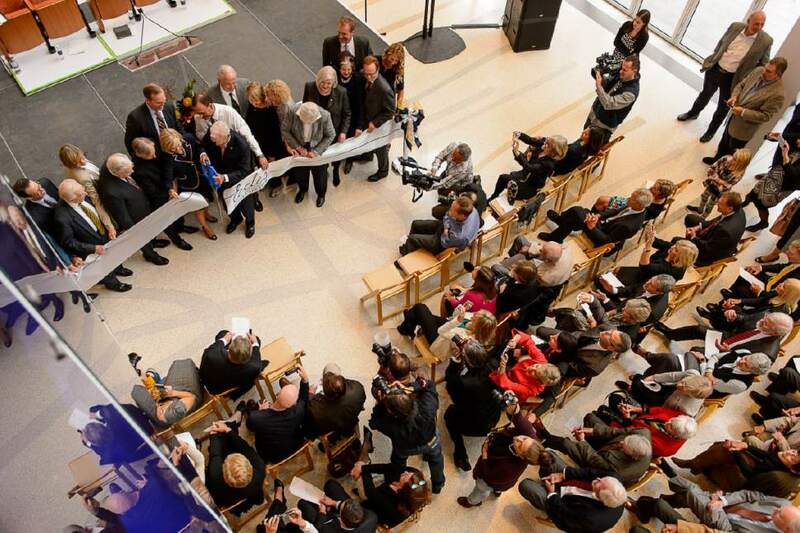 Trent Nelson | The Salt Lake Tribune The ribbon is cut by Spencer F. Eccles at the official opening ceremony of the George S. and Dolores Doré Eccles Theater in Salt Lake City, Tuesday October 18, 2016. 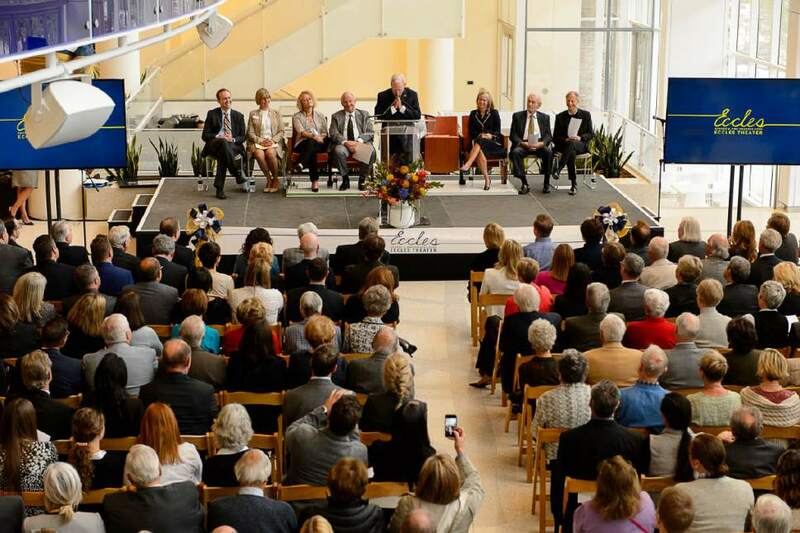 Trent Nelson | The Salt Lake Tribune The official opening of the George S. and Dolores DorÈ Eccles Theater in Salt Lake City was celebrated with a ribbon cutting ceremony on Tuesday. Trent Nelson | The Salt Lake Tribune Spencer F. Eccles speaks at the official opening ceremony of the George S. and Dolores Doré Eccles Theater in Salt Lake City, Tuesday October 18, 2016. Trent Nelson | The Salt Lake Tribune Spencer F. Eccles speaks at the official opening ceremony of the George S. and Dolores Doré Eccles Theater in Salt Lake City, Tuesday October 18, 2016. Trent Nelson | The Salt Lake Tribune A standing ovation is given as Spencer F. Eccles speaks at the official opening ceremony of the George S. and Dolores Doré Eccles Theater in Salt Lake City, Tuesday October 18, 2016. Trent Nelson | The Salt Lake Tribune Salt Lake City Mayor Jackie Biskupski embraces Spencer F. Eccles at the official opening ceremony of the George S. and Dolores Doré Eccles Theater in Salt Lake City, Tuesday October 18, 2016. 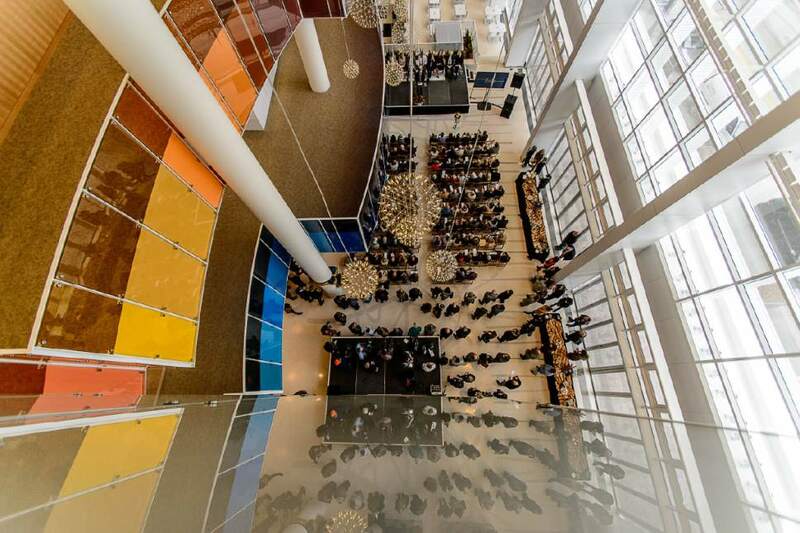 There was pomp and circumstance  and a little "Fiddler on the Roof"  on Tuesday as dignitaries dedicated the George S. and Dolores Doré Eccles Theater in downtown Salt Lake City. 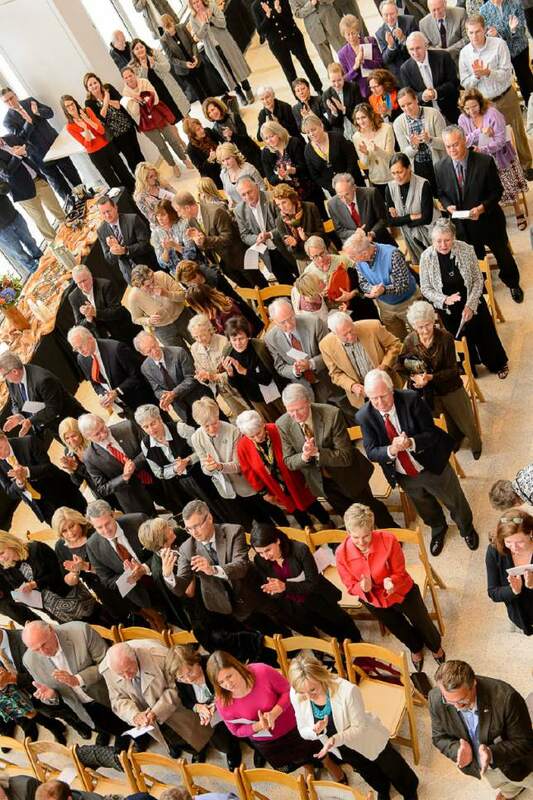 "I don&apos;t know if I&apos;ve ever seen this many important people in one place," quipped Max Burdick, chairman of the Utah Performing Arts Center Agency, who emceed the festivities. He also sits on the Salt Lake County Council. Some 250 people were on hand for Tuesday&apos;s event. The new facility was lauded for its beautiful, modern design and the skillful engineering that allowed the erection of the 2,500-seat playhouse on a relatively small footprint sandwiched between Main Street and Regent Street just south of 100 South. 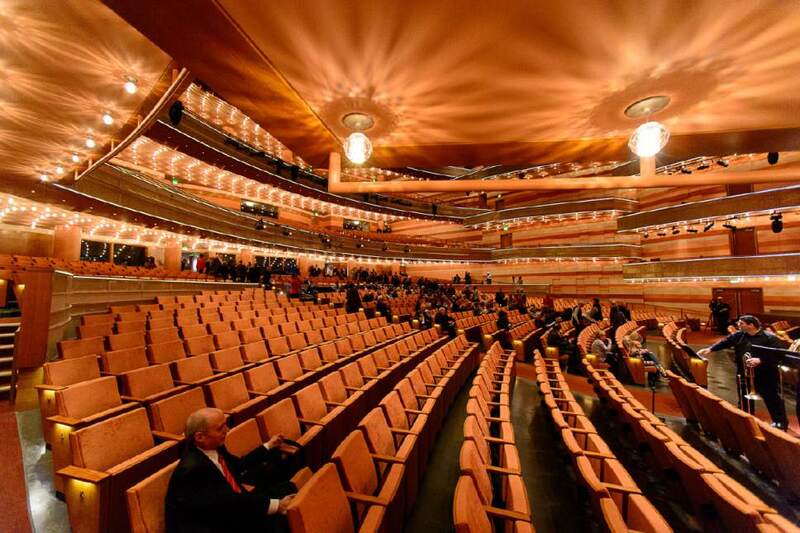 Take a virtual tour of the Eccles Theater. The $119 million theater, built to attract traveling Broadway musicals, boasts a facade of steel and glass that lets light pour into a vaulted six-story lobby, while giving theatergoers a panoramic view of Main Street. The stage and seating inside allow perfect sightlines from all vantage points. Crystal-clear acoustics were demonstrated Tuesday by The Ballet West Orchestra Antiphonal Brass Ensemble, as well as Cottonwood Heights vocal phenom Lexi Walker. 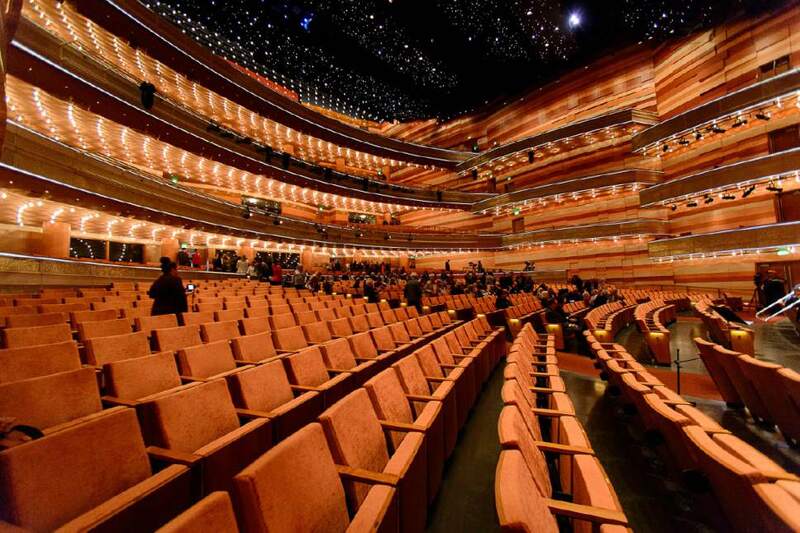 The theater is the work of the renowned designer César Pelli of New Haven, Conn.-based Pelli Clarke Pelli and Salt Lake City&apos;s HKS Architects. Utah&apos;s Layton Construction built the structure. Speakers used superlatives to describe the gem, such as extraordinary, inspiring, beautiful and magnificent. "This is a place where many great memories will be made," said Salt Lake City Councilwoman Lisa Adams, who also sits as the chairwoman of the Redevelopment Agency. Many praised former Salt Lake City Mayor Ralph Becker, who spent much of his eight-year tenure pushing his vision for a regional theater that would bolster the city&apos;s reputation as an art center, while acting as an economic engine to enliven downtown. Among those lauding Becker was Salt Lake County Mayor Ben McAdams. "This is a landmark day," he said, "a tremendous opportunity for our region&apos;s downtown hub." Another honorable mention went to D.J. Baxter, the former executive director of the Redevelopment Agency, who labored to make it a reality. Eight speakers, including first-term Salt Lake City Mayor Jackie Biskupski, expressed gratitude to dozens of others who made the project possible. "I&apos;m grateful to those who came before and made this happen," she said. 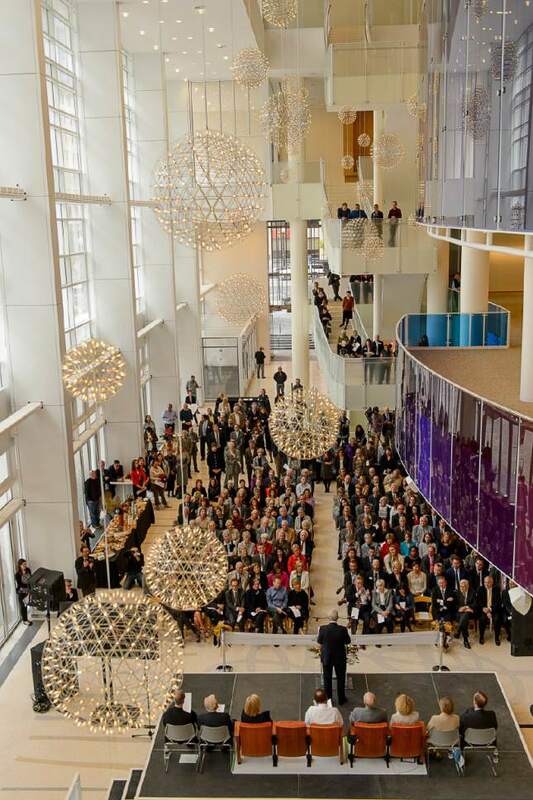 "This is a new home for arts and culture in Salt Lake City." But the show was stolen by philanthropist Spencer Eccles, of the Eccles Foundation, who spoke of the tradition of theater in Utah and then broke into "Tradition," one of the songs performed by Tevye, the protagonist from the 1964 Broadway musical "Fiddler on the Roof." Eccles then sang three bars of "If I Were a Rich Man," which brought down the house with laughter, applause and a standing ovation. Other major donors were recognized, including Delta Air Lines, The Church of Jesus Christ of Latter-day Saints, the Larry H. and Gail Miller Family Foundation, O.C. Tanner and the Ken Garff Automotive Group. Adams called the project a successful public-private partnership. She applauded the effort that raised $37.7 million in private donations. The Eccles Foundation provided $15 million of that sum. The largest part of the public funding  about 70 percent of the total construction costs  will come from property taxes originally earmarked to retire the debt on the structure now called Vivint Smart Home Arena and the Salt Palace expansion. City officials called it "redirecting the resource." Taxpayers were not given a choice in the decision. The theater is jointly owned by Salt Lake City and Salt Lake County. It is operated by the county. Although it originally was scheduled to open in April, a number of speakers called the construction a great success. "What goes into one of these types of facilities is just beyond …" Burdick said. "Whenever there was a problem, we found a solution." The Premiere Performance is scheduled for Friday. Oscar-winner Rita Moreno will emcee the show with Tony Award-winner Brian Stokes Mitchell, Megan Hilty (of TV&apos;s "Smash"), as well as performers from Ballet West, Repertory Dance Theatre, Ririe-Woodbury Dance Company, Utah Opera Chorus and the University of Utah theater department.